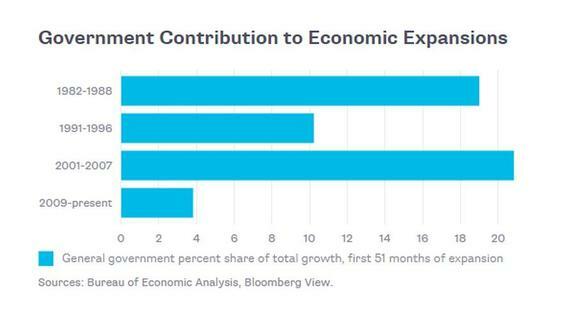 The number one issue for voters in the 2014 mid-term elections was the economy, by far. Seven in 10 voters said the nation's economy is in bad shape and 78 percent are worried about the economy. Voters who said the economy was important to them voted 2 to 1 for Republicans. Tellingly, five out of five state ballot measures to increase the minimum wage were all passed, including in the red/semi-red states of Arkansas, Nebraska, South Dakota and Alaska. And, 63 percent of voters said the economic system "favors the wealthy." Many have found this odd because the unemployment rate keeps coming down, the stock market keeps going up and we're told the economy is growing. But those traditional indicators of economic conditions clearly no longer accurately reflect the economic reality as lived by tens of millions of Americans. The gross domestic product (GDP) is basically the total value of goods and services produced in the US and is a primary gauge for evaluating the condition of not just the economy, but also the economic circumstances of Americans who, after all, have to be working to produce those goods and services and have enough money to buy them. The chart clearly shows that the dramatically underperforming economy was directly and immediately caused by the financial crash of 2008. 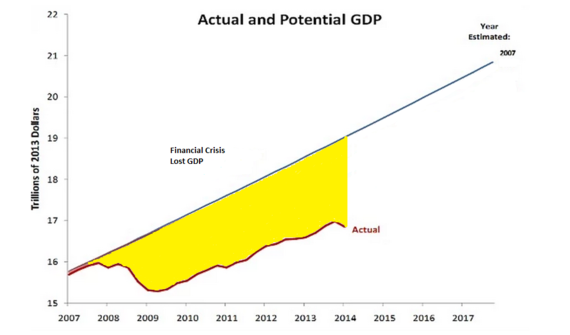 The yellow area represents all the goods and services never produced, the growth never achieved, the jobs, savings and homes lost, all as Better Markets detailed in its report on the Cost of the Crisis. Yes, the 2007 and 2008 projections were likely inflated to some indeterminable extent due to the pre-crash housing bubble, but the chart nevertheless broadly captures the post-crash lost economic output. This chart makes clear that the standard of living in the country hasn't just stalled, it has collapsed and tens of trillions of dollars have been lost and tens of millions of lives have been enormously damaged economically. Put differently, the yellow area in the chart above is the depth of damage and pain inflicted on the American people in lost jobs, wages, savings, income, wealth and, too often, hope, as dreams for homes, education, retirement and so much more first get put on hold and then silently slip away. That is the reality of the gnawing economic insecurity -- plus frustration, anger and fear -- that too many Americans took to the polls with them. As important, the chart also shows that the Congressional Budget Office (CBO) has over-estimated US GDP growth every year from 2007 to 2014. Like many, the CBO estimates that future growth and the economic circumstances of American families will normalize and return to pre-crash levels. This thinking is simply blind to the virtually unprecedented historic level of damage done to the economy by the financial crash. Politicians -- including too many running in 2014 -- have been similarly blind to the economic calamity that financial crash has caused Americans, as voters made clear in the mid-term elections. Okay, the economy is bad, but why is that bad for the president and his party? 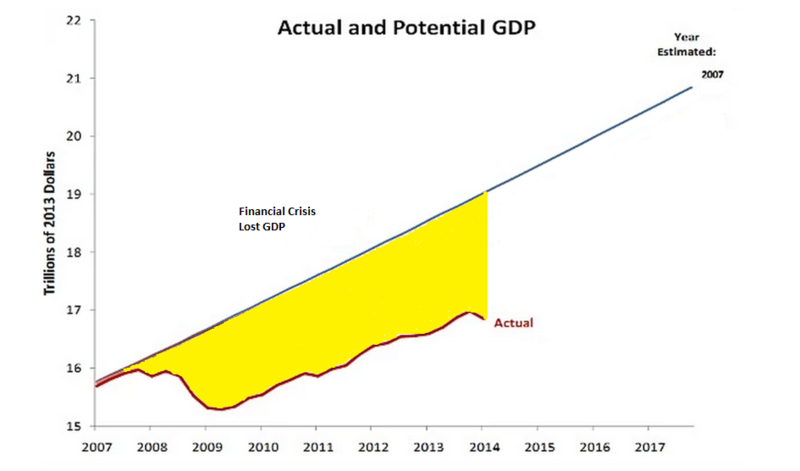 Unfortunately, while tens of millions of Americans suffered and continue to suffer from the economic wreckage of those years (the yellow area on the chart), no one has ever offered a clear, compelling accurate explanation of why the American people are in such dire economic circumstances. What caused this and who is to blame are questions never asked and never answered. As a result, the American people are hurting and, rightfully, mad. Adding insult to injury, they also see Wall Street getting trillions of bailouts, billions in bonuses, bouncing back without any accountability and welcomed with open arms in the corridors of power in Washington DC. With no one else to blame, the president and his party get blamed. Put another way, if something is wrong, seriously wrong, that directly impacts the kitchen table day-in and day-out and there's no visible, understandable, plausible reason for those circumstances, then whoever is convenient will do because something, anything must change. That is the key reason the president was such a potent Republican weapon in the mid-term elections and why his party suffered so many defeats by such large margins. In the absence of an economic miracle (as Larry Summers points out), the economy is likely to continue to substantially underperform (just as it did after the Great Crash of '29 and during the Great Depression). Thus, American families and voters are going to continue to be under enormous economic stress for the foreseeable future. While everyone must do everything possible to change that, the key political question is who is going be blamed for a bad economy that will almost certainly remain bad into the 2016 election cycle, if not well beyond? Put differently, while most want to forget the devastating financial crash of 2008 and Wall Street's role in it, will anyone ever put blame for today's economy and the ongoing damage to American families where it really belongs: on Wall Street and those who crashed the economy, plus those who mindlessly pursue spending cuts and austerity?